Bob the Snowman was a kit that I purchased a few years ago from The Quilt Patch in Moose Jaw, Saskatchewan. Earlier this year I put the kit together minus all the buttons. Since I had a lot of other sewing to get done, poor Bob languished for months unfinished. Everything was a go since he was together with the backing and batting. 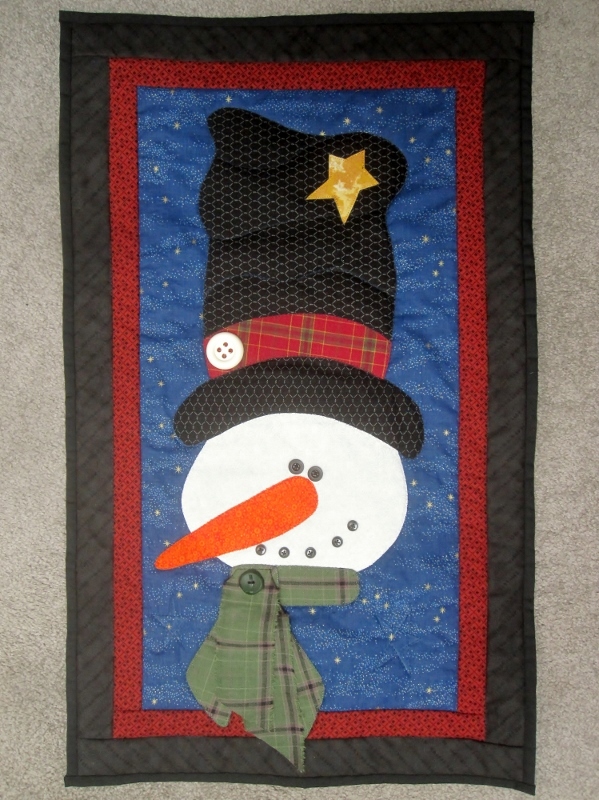 I machine quilted him, bound the quilt and then added the buttons. Part of his scarf is 3D. The label and hanging sleeve were put on this morning and I can now cross Bob off my list. I think I'll put a quilt on the frame now and do some hand quilting. All good things get finished in time, and Bob is a lovely addition to your family. Bob looks very warm in his scarf, a great finish. Enjoy the quilt you intend to hand quilt. Very cute, Dolores! Love his hat. I think Bob the Snowman is really cute. I'm glad snowmen are still wearing top hats instead of backwards baseball caps. This is a sweet wall quilt. Cute! Love the 3D scarf. Extra dimension. I'm glad he is now so perky and festive looking .... just in time...cuz you know what is sneaking on us..... acckkk! He's adorable!!!! And just in time, lol!